Hamlet has attracted some of the biggest names in film and theatre to play the conflicted, surreptitious and eccentric titular protagonist, but as a self-confessed philistine, I reluctantly admit this was the first time I had the pleasure to see Shakespeare’s classic tragedy on stage. I was treated to a Hamlet with such intensity, life, and humour, I could quite contentedly take my seat at the Olivier to see it again and I am sure I will be just as encapsulated. The play has become ubiquitous on the UK stage in recent years with Jude Law, David Tennant and, most recently, John Simm taking on the role largely to critical acclaim. 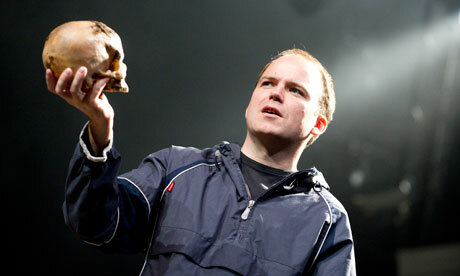 Hamlet here is played by Rory Kinnear, who had a small role as a peripheral character in the much lauded political comedy the Thick of It. A character of Hamlet’s sheer magnitude, presence and complexity was inhabited by an actor who at first seemed quite unassuming and innocuous but grew in to the role with verve. Kinnear’s physicality conflicted with my preconceptions of the character. He has a receding hairline, is rather small and baby faced but my preconceptions were soon cast aside as Kinnear grew exponentially in a note perfect foray into faux madness and clandestine plotting. There was a child- like quality to his interpretation of the character, his energy and vivacity running concurrently with his petulance and the humorous ways he would conduct himself in order to maintain the façade of madness. This was clearly a man using the pain of his father’s death in order to feed his convincing portrayal of madness like some masochistic method actor. There are occasions that he conveys the essence of an angst ridden teenager behaving in such a way as to incur attention. Nicholas Hytner’s production brought the play in to a 21st Century context and there is a definite stamp of the modern era within this production. Every word that is uttered within the palace walls is closely monitored by a security presence- their appearance akin to a sinister group of government agents; clad in dark glasses, black suits and ear pieces into which they are always seen speaking suspiciously hushed tones in to. A pertinent and clear device to show the claustrophobic and increasingly paranoid milieu that pervades Hamlet’s world whilst also looking at the same behaviours microcosmically which have a larger significance in an era where the CCTV camera reigns supreme. The surrounding cast are excellent with Ruth Negga flowing with naivety and vulnerability in her Ophelia and to give the play a further thrust of 20th Century culture, she turns to the modern band X and Y for solace in the throes of a mental breakdown- a ready reminder that this is a Hamlet for the 20th Century. Clare Higgins is also excellent as Gertrude who is at once both strong and clearly absorbed by guilt and fear. The play was cleverly staged and crafted with simplicity, allowing for it to flow and the audience to be immersed in the tragic events. The entire cast made this a performance I am glad to call the first of and I am sure what will prove to be many, productions of Hamlet- and I am confident that this will remain quite possibly, the best.